Momservation: Note to Mom: I get it. 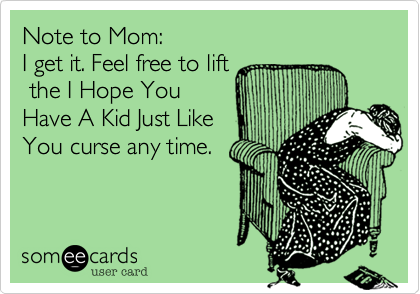 Feel free to lift the I-Hope-You-Have-A-Kid-Just-Like-You curse anytime. I’m sorry for all the nasty talk-back sh** I was saying in my head every time you deservedly yelled at me. I apologize for the evil daggers I shot at you with my eyes while tuning out your rant, thinking I had you fooled that I was still listening with my fake apologetic face. I understand now you were extremely patient with me, giving me much more room to mature than I deserved, when you should’ve just smacked that smug look of perceived superiority off my face. Boy, is my hand twitching right now. But as I stare into the face that is shooting daggers at me, thinking I can’t tell that she’s got a really mean thought bubble over her head right now, something about her looks familiar. It is me. Thirty years ago. Dang, I could really be a brat. And, in hindsight, I actually didn’t know everything. How ‘bout that. I was sure I did. Little did I know then, when I thought I won with my silent defiance forcing my mom to throw up her hands in exasperation and say, “You’re not even listening! I hope you have a kid just like you one day!” that it was actually a curse that would one day bear fruit. So, while I’m gently guiding and patiently waiting for my mini-me to get her sh** together, I try to remember that I was once a work in progress too. And as much as I’d like to let her know I got a secret decoder ring to her nasty little thought bubbles and could bring her to her knees in a verbal throw-down, I will keep my guns holstered. And also nominate my parents for sainthood. But I tell you what. I don’t do curses that take decades to come to fruition. I’m more of an instant gratification gal. And even though I’m graciously refraining from acknowledging the nasty little thought bubbles over my preteen daughter’s head in the name of patient parenting, my tolerance only goes so far. Yep, if this girl’s not careful she’s going to find herself in a rap battle throw down. That’s right – not only have I been there, done that, bought the T-shirt on silent defiance, but Mom’s got mad skills with the rhyme! Not only will I call her out on her nasty little thought bubbles, I will sync it to verse and embarrass the sh** out of her in front of her friends in bad LMFAO fashion. Who needs a curse when you have threat of public embarrassment? This entry was posted in Parenting humor and tagged family, hope you have a kid just like you curse, Kelli Wheeler, kids, LMFAO, momservations, parenting humor, patient parenting, silent defiance.